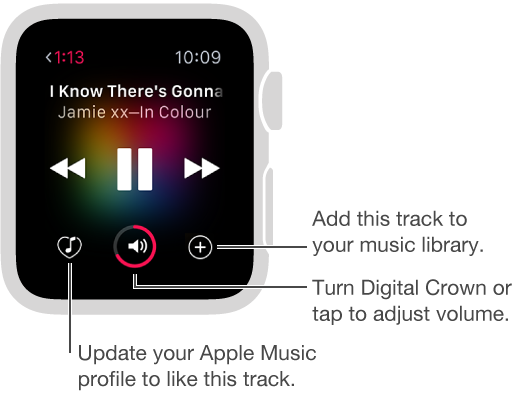 Use the Music app or the Now Playing glance on Apple Watch to control music playback on iPhone. Play music on iPhone. 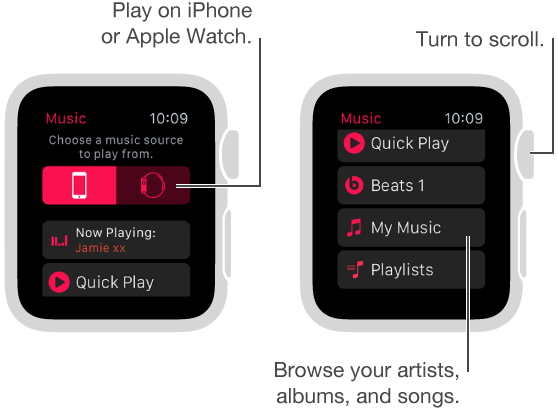 Open Music on Apple Watch. Tap to browse playlists, albums, artists, or songs, then tap a song to play it. 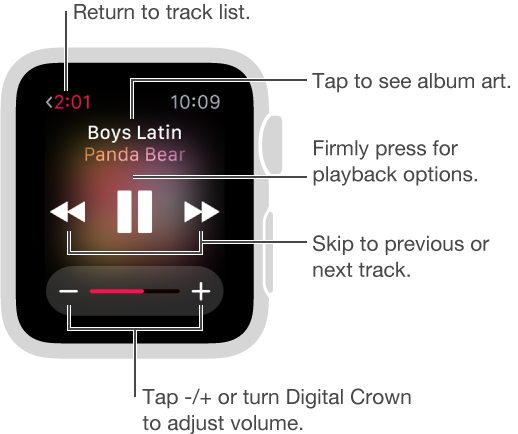 If you don’t see the music you’re expecting, make sure iPhone, not Apple Watch, is your source—firmly press the display, tap Source, then tap iPhone. Play Apple Music. If you subscribe to Apple Music, you’ll see buttons on either side of the volume control. Use them to like a track or add it to your music library. Send audio to another device with AirPlay. While viewing the playback controls, firmly press the display, tap AirPlay, then choose a destination. Shuffle or repeat songs. While viewing the playback controls, firmly press the display, then tap Shuffle or Repeat. Control playback with the glance. Swipe from the watch face to the Now Playing glance for quick control. Swipe up on the watch face, then swipe left or right to the playback controls. If you don’t see the Now Playing glance, open the Apple Watch app on iPhone, tap My Watch, then turn on Music > Show in Glances.